Intuitive Intuitive touch based interface can be customized to your exact needs. Create and save multiple layouts tailored for different projects and producers. 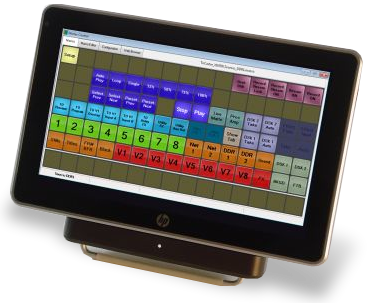 Macros Powerful step/time macros execute a series of complex steps with a single touch, timed exactly to your production's needs. Increase productivity and eliminate operator error by reducing complicated tasks to the touch of a single button. Control one or more modules all from the same macro. Portable The compact footprint of Master Control fits into any studio or location production. Wireless networking provides portability and additional flexibility. Universal Control Expandable design allows operators to customize Master Control to operate a myriad of devices and software. Choose only the modules you want and easily add new ones as they become available through the built-in add-on store. Flexibility Multiple Master Control units can operate together. Tasks can be shared among multiple simultaneous operators. Get interactive with your projects by having one Master Control signal and control another. Redundancy Identically control two or more of the same module automatically.